A few passing clouds, otherwise generally clear. Low around 55F. Winds WSW at 10 to 15 mph. 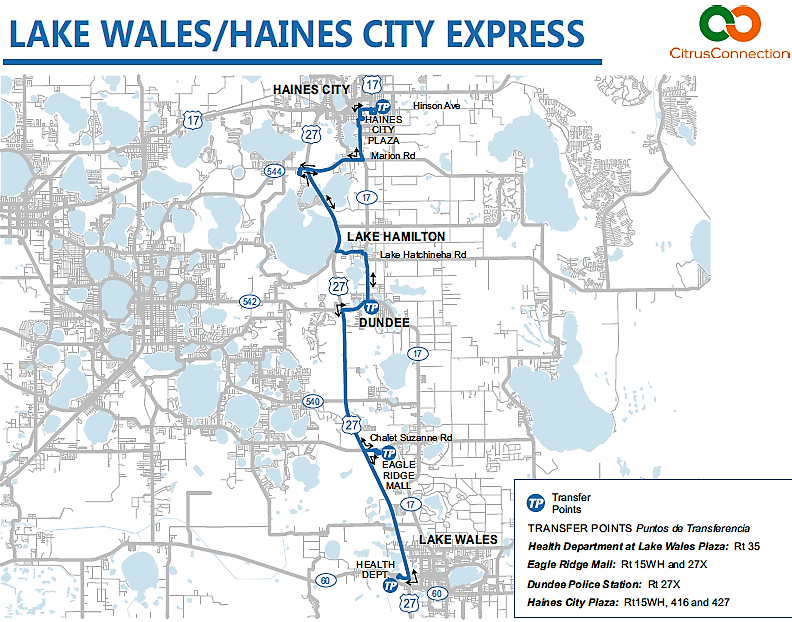 Starting Oct. 1, Citrus Connection will be offering an express service bus route between Lake Wales and Haines City. LAKE WALES – Citrus Connection Director of External Affairs Erin Killebrew will soon be giving elected officials in Haines City, Dundee and Lake Hamilton a similar presentation to the one she gave in Lake Wales March 3. Over the last few months, members of the Ridge League of Cities lobbied Citrus Connection staff and the Polk County Commission for a bus route along U.S. 27. Killebrew said that in February during the annual board retreat at Circle B Reserve, Polk County Commissioners agreed to pay 80 percent of the $366,000 cost for the first year with the four cities mentioned paying the remaining 20 percent. Killebrew said that the federal government has a history of paying 50 percent of mass transit costs for local governments, but because this bus route is being added somewhat suddenly, federal money is not applicable for the first year of service. Killebrew said Citrus Connection staff would apply to have this route subsequently subsidized with federal taxpayer dollars. The “fair share” for Lake Wales residents starting October 1 will be $25,130. If the federal government subsidizes the route extension, that number may go down in subsequent years. Lake Wales has the highest share due to the amount of miles traveled, not ridership numbers. Haines City residents are being asked to pay $13,527 in the first year; Dundee residents will be on the hook for $9,578 and Lake Hamilton residents are being asked to pay $11,036 for the first year of service. Currently there is a U.S. 27 bus route from the South County Jail in Frostproof, through Lake Wales and Eagle Ridge Mall to the Dundee police station. There is currently no service in Lake Hamilton. The new line will run from the Health Department building on State Road 60 in Lake Wales up through Posner Park. near the intersection of Interstate 4 and U.S. 27. The Frostproof City Council has repeatedly voted not to approve any local funding for mass transit and will not be included in the new service. Stops and route times have not been set because first Citrus Connection staff have to make sure elected officials in these Ridge communities approve of the plan and budget money toward it. Killebrew said that if the U.S. 27 Express Bus route is opened, it will vastly expand mass transit services for Polk County residents. Lake Wales City Manager Ken Fields and Mayor Eugene Fultz both expressed support of the plan. The addition of this line, if approved by vote possibly around summer time, would mean Lake Wales residents would be paying around $90,000 per year for mass transit in 2020.